It’s not hard to see why tourism in Myanmar has been booming lately. With so many different locations and experiences, there’s bound to be something for everyone. 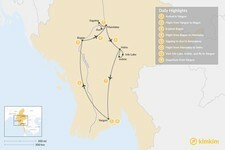 For those interested in historical sites, Myanmar is one of the best destinations in Southeast Asia. Various kingdoms have come and gone over time, leaving behind a wide array of temples, pagodas, and other monuments. Myanmar also has a plethora of ethnic groups, resulting in a colorful blend of cultures. The people of Myanmar lead all kinds of lives, shaped by urban, rural, and religious influences. Throughout this 8-day tour, you will be able to see all of this for yourself. Yangon, also known as Rangoon, is Myanmar's largest city, primary commercial hub, and former capital. The city’s historical colonial and religious influences have survived despite its status as a rising Southeast Asian city, making for a truly unique experience. Shwedagon Pagoda is the most important religious site in Yangon and all of Myanmar, and no trip to Myanmar is complete without witnessing it. The temple is gilded in over 40 tons of gold leaf and stands almost 100m tall, a golden spire dominating the Yangon skyline. You’ll enter through the eastern staircase, where stalls offer robes, offerings, incense, and other fascinating Buddhist objects for sale. 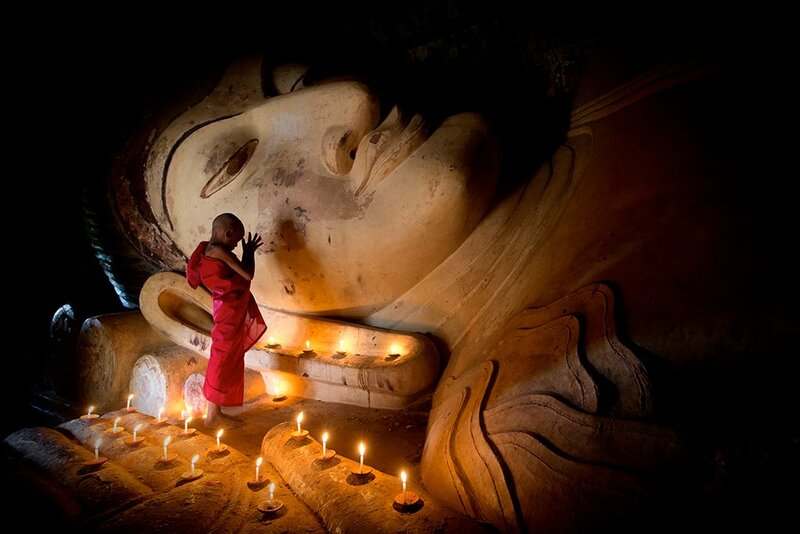 A guide will accompany you and explain all you need to know about the details and rituals of Burmese Buddhism. 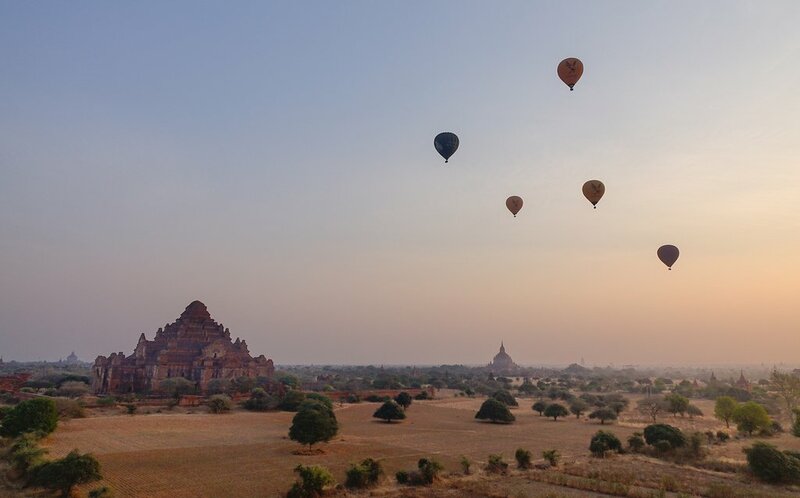 Catch a morning flight to Bagan and get a chance to see not only its famous temples but also understand its culture and tradition of artisan craftwork. Visit Ananda Temple before the other tourists arrive, and see for yourself one of the region’s most significant and splendid sites. Then, continue on to the many other temples around the nearby plains, mostly built during the golden age of the 9th-14th centuries. On the way, watch as farmers and workers go about their daily life. In the afternoon, go for a private boat ride down the Irrawaddy River and cruise past villages, fishermen, and other boats. Get great views of Bagan as the sun sets, sip on a cocktail, and wind down after an amazing day of sightseeing. Your adventure in Bagan continues for another day packed with activities. 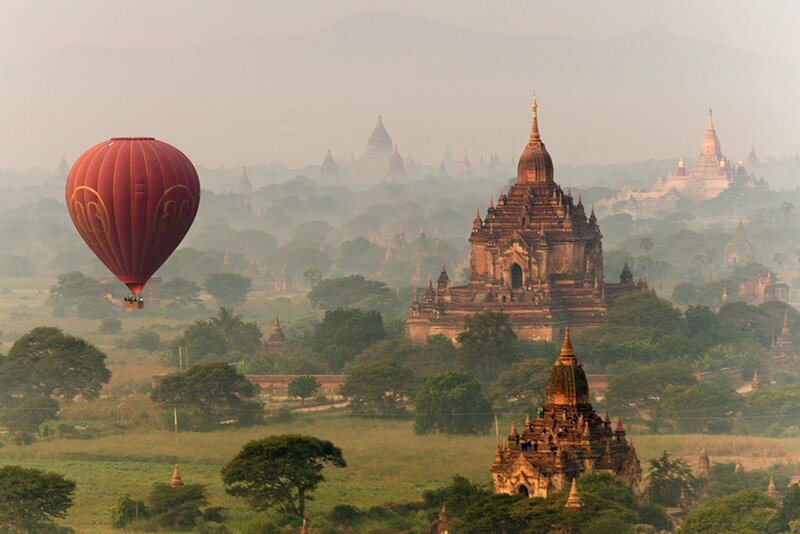 If you’re visiting between October and March, start off the morning with a hot air balloon ride as the sunrise lights up the countryside, the temples, and the Irrawaddy. After breakfast, arrive at the bustling Nyaung Oo Market, where locals sell and buy all sorts of produce and goods. 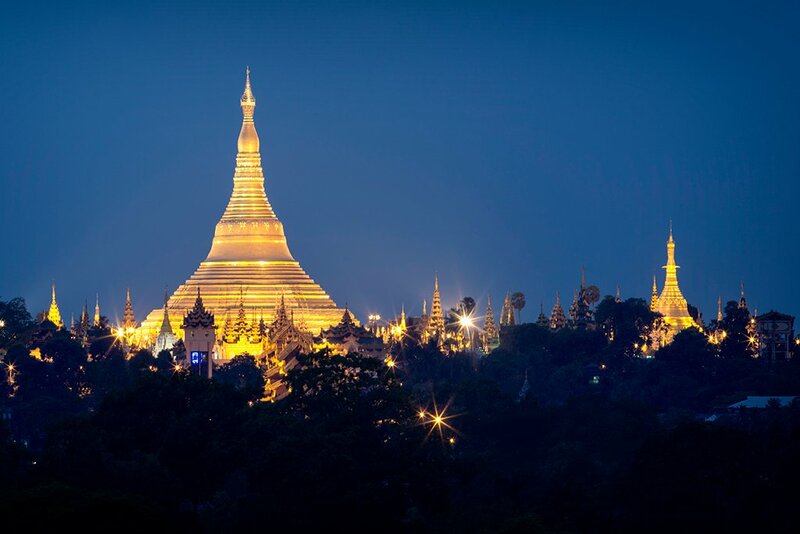 Then, head to the Shwezigon Pagoda, which dates back to the 11th century. Visit more temples, monasteries, monuments, and even get a chance to explore a village and glimpse at the local customs and lifestyles. This morning is flexible, made to fit your interests, and can include a short side trip to other smaller monuments. In the afternoon, ride a horse cart past the Thatbyinnyu, Bagan’s largest temple, and the Dhammayangyi, known for its distinct brickwork. Finally, watch the sunset from a temple’s upper terrace and soak in the amazing view one last time. Mandalay, the second largest city of Myanmar and an ancient royal capital, is known for both its traditional, timeless allure and its booming vibrancy. Resting on the banks of the Irrawaddy, Mandalay is the cultural center of Myanmar and has preserved a rich tradition of music, dance, and drama. After a one hour transfer into the city, visit the Mahamuni Pagoda, which houses one of Myanmar’s most prominent Buddha images. Then, continue to the Kuthodaw Pagoda, which contains a collection of 729 Buddhist marble slabs. Head a bit south to the Kyauktawgyi Pagoda and lay your eyes on an immense Buddha figure carved from a single block of marble. Last of all, stop by the Shwenandaw Monastery, the only surviving royal structure in Mandalay, and appreciate the wood carvings and intricate 19th-century architecture. Discover Amarapura, Ava, and Sagaing, starting at Sagaing Hill’s 600 ivory pagodas, 3,000 monks, and nearly 100 meditation shrines. 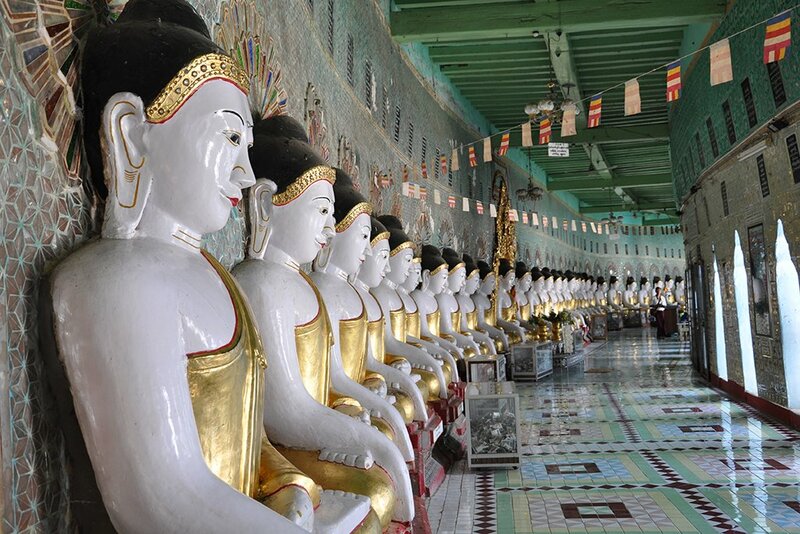 You’ll also visit pagodas such as Swan Oo Pon Nya Shin, U Min Thone Sae and Shwe Taung Oo Maw. Continue to Sagaing’s local market, then head over to a small pottery village and observe the tradesmen hard at work. Next, we go to Ava, the standing capital from the 14th through the 18th centuries. Ferry across the and travel in a traditional horse carriage to the wooden Bagaya Monastery renowned for its elaborate woodcarvings. Be sure to see the Nanmyint Watch Tower, the “Leaning Tower of Ava”. In the afternoon, head to Amarapura, the “City of Immortality”. First, visit a silk weaving workshop, then stop by Mahagandayon Monastery, home to more than 1,000 young monks dedicated to strict study and discipline. 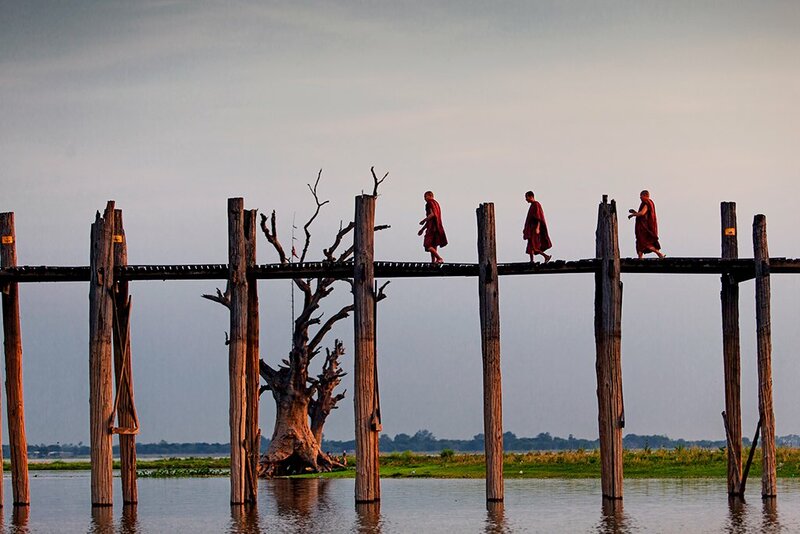 Catch the sunset while strolling on the U Bein Bridge, the world’s longest teakwood bridge spanning 1.2km across the Taungthaman Lake. After a day of nonstop new sights, head back to Mandalay at night. Board a morning flight to Heho and drive for an hour along a scenic route which leads to Nyaung Shwe village, the gateway to Inle Lake. Along the way, encounter workshops that specialize in traditional Shan paper and umbrella crafting. Upon reaching the lake’s shores, a short orientation tour will introduce you to the temples, monasteries, and tea shops of Nyaung Shwe. Then, ride a private motorboat across the surface of Inle Lake. As the hills and fishing canoes fade into the background, take your time to enjoy one of Myanmar’s most breathtaking sights. You will pass the stilt houses of the local Intha people, local fishermen, and floating gardens. Next, visit Nga Hpe Chaung Monastery, which houses several Buddha images and was once known for its jumping cats. Proceed to the Phaung Daw Oo Pagoda, the region’s main religious and ceremonial site, which contains five sacred Buddha images decorated with gold leaf. If you’re interested, you can even visit a local workshop and see silk-weavers, boat-builders, cigar-makers, blacksmiths, or silversmiths in action. The day will come to an end with a boat trip back to your hotel. 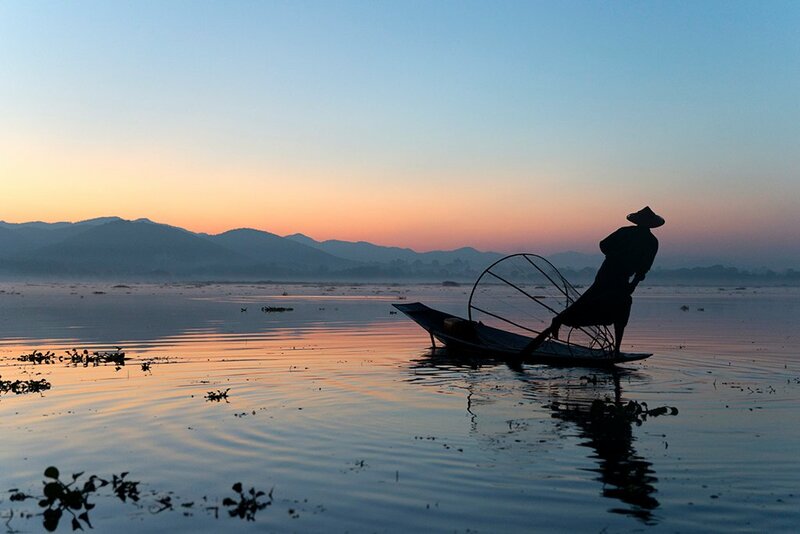 A one-hour boat ride will take you to the western shores of Inle Lake. Take a leisurely stroll around the Pa-Oh village of Indein before ascending a hill to the Indein Pagoda complex. Explore the stupa ruins shrouded by tropical plants as well as an iconic Buddha image. Then, ride back and stop at the Inthar Heritage House to learn more about the culture of the region’s indigenous people. Enjoy your last boat ride from your hotel on the lake to Nyaung Shwe. From there, you’ll transfer to Heho Airport for your domestic flight to Yangon. Unfortunately, your time in the enchanting country of Myanmar has come to an end. Transfer to Yangon International Airport, check-in for your flight, and say goodbye. Myanmar is a tropical country in Southeast Asia with a climate affected by monsoon patterns. Temperatures and rainfall levels depend on the season, and also differ between highland and lowland locations. On average, the northern, mountainous region is the coolest, while the delta and coastal regions are the wettest. As in many other equatorial Asian countries, Myanmar has two broad seasons: the dry season (November-May) and the rainy season (June-October). However, the dry season can be further divided into the cool (November-February) and hot seasons (March-May) for a total of three distinct seasons. With pleasant temperatures in the beginning, less rainfall, and several festivals, the dry season, especially during the cool season, is a great time to visit anywhere in Myanmar. Bagan, Mandalay, and other central plains regions will rarely see rain. However, visiting towards the end of the rainy season isn’t a bad idea either. Yangon International Airport is located in Mingaladon, about half an hour from the downtown area. The airport was recently renovated and supports a decent number of international flights from carriers such as Malaysia Airlines, Korean Air, and All Nippon Airways. Finding a direct flight in from major Asian cities such as Hong Kong, Bangkok, Singapore, Hanoi, Seoul, and Tokyo shouldn’t be a challenge. 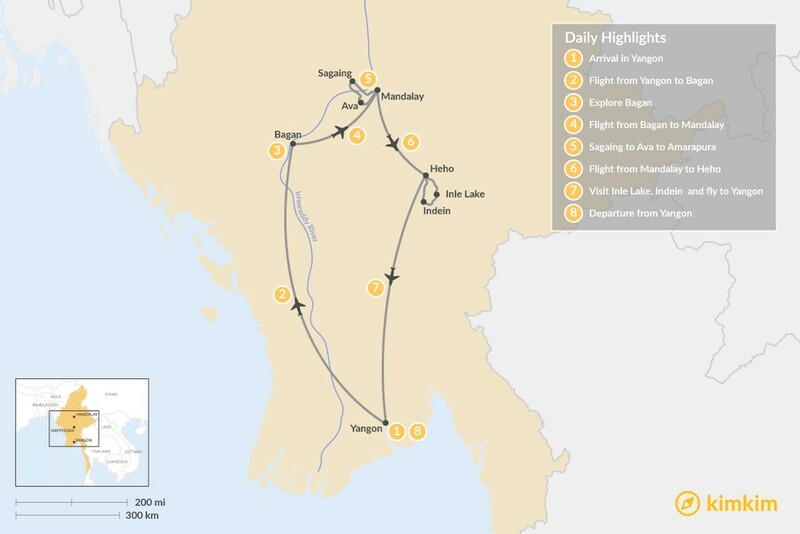 This makes it relatively easy to combine a trip to Myanmar with a larger plan including other countries in East/Southeast Asia. However, flying in from the US and elsewhere most likely requires multiple connecting flights, meaning getting into Yangon can take almost an entire day of flying and stopping at airports. Make sure to get a visa in advance. Very professional experience that meet expectations. I would recommend both kimkim and Anne.